I have been away from this space for a long time. We have moved, we started settling in a new city and a new state. I have been homesick more than I would ever admit. I thought about archiving this thing. I have been on and off blogging for a long time, but it never felt completely organic for me. What is the point? First up is the crossroads block 1. Because I feel we are at the crossroads, at a point where we need to ask ourselves what is next. Ever since the inauguration day, I have been practically paralyzed and glued to the TV. I couldn’t believe what was happening in our country and to our country. To our people. All our people. My weaving was forgotten, loom half dressed. There was a pile of quilt tops that need to be basted and quilted. They were sitting on my bench in the living room. I sat at the sewing machine once and was not able to do anything. Completely uninspired and distracted by events that were shaping my children’s future in a scary, scary way. I thought of turning of TV, delete Facebook and Instagram apps from my phone. Then I looked at my children again and thought, no, that’s wrong. Saying nothing is the same as agreeing with what is going on. With the president and the administration. I cannot stay passive and voiceless and look at my children in the face. I cannot stay passive and voiceless and look at myself in the mirror. I cannot stay passive and voiceless and sleep at night. I just can’t. But, as I wrote a couple of posts ago: what can I do? I said quilt, but quilt what? Then one day I was listening to a podcast while walking the dog and I heard this story about the Underground Railway Quilts. According to this story, quilts with secret “codes”, known only to slaves, were made to help on the journey to freedom. These quilts would be placed on the dance or out to window to “air out”, but really they were signaling specific actions for the slaves on the road to freedom. For example, a log cabin block was used to signal that the place is a shelter or the person is safe to talk to. The stories of these quilts are part of African American folklore. Some historians do not believe this really took place but whether it really happened, or it’s just a story, it’s a beautiful one (http://news.nationalgeographic.com/news/2004/02/0205_040205_slavequilts.html). As I was looking through the blocks and their supposed meaning (http://home2.fvcc.edu/~cgreig/final/blocks.html), I came across the crossroads block which is said to refer to Cleveland, Ohio, which was a place from which slaved could take several routes to freedom. It could also mean that a person has reached a point in their life when your life is about to change and you must be willing to go on. That spoke to me. As I said, I feel we have reached point where we need to change our ways and decide which way to go; and stand our ground and persist and resist. Since then I have made many blocks and many more are coming. 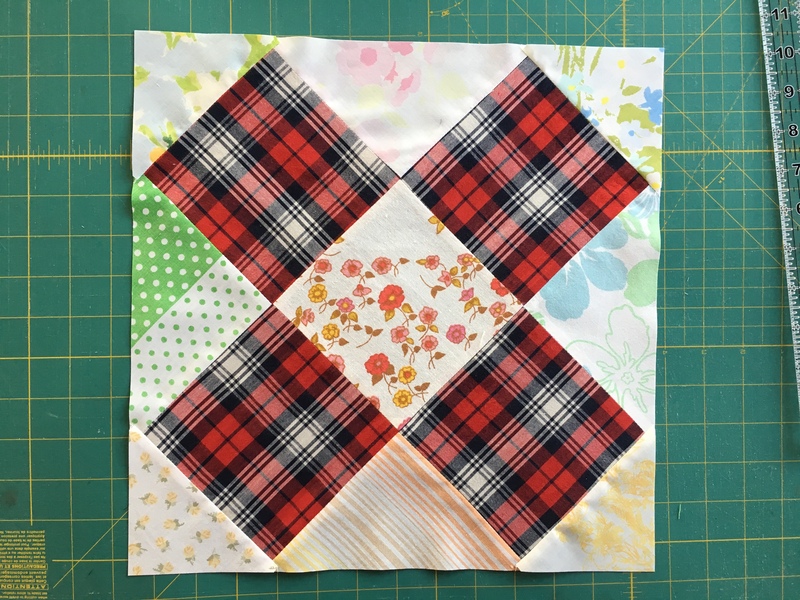 This entry was posted in crossroads block, quilting and tagged 100quiltsofprotest, resist, standforyourrights, standforyourvalues on January 31, 2017 by flekka.